This Is Getting Old: Who Is Buying This Crap? Who Is Buying This Crap? 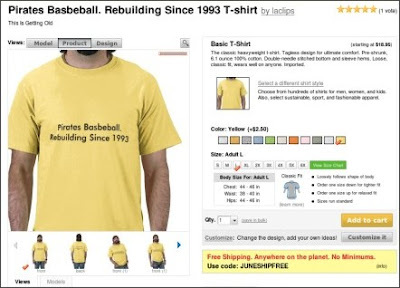 If you look at the bottom of this page you will see a T-Shirt from Zazzle.com. I made this shirt about a year and a half ago when I started this blog. In the last two weeks I have sold 5 of them. I thought we were in a recession. People have credit card bills out the wazoo but are buying my shirt. I am now a T-Shirt retailer. Whats next? Jeans? Polo's? There's no stopping me. If you have an extra $21.45 laying around then buy my shirt. I get like 2 cents for each one sold. I'm on my way to an early retirement. Maybe I should buy one since I don't even have one. If you want to contribute to my retirement fund follow this link. Christmas is only 183 days away. Free shipping until the end of June. I'm just throwing that out there. Buy my shirt! That's funny. I never noticed that. Haha. Those unlucky bastards. No Refunds! Ok, I went and changed it but 5 other people didn't notice it either and that's just too funny. I need to stay away from the internet while drinking.